Home Lorenz Waldmann Peppery Winds: A Novel of the 1st Century C.E. 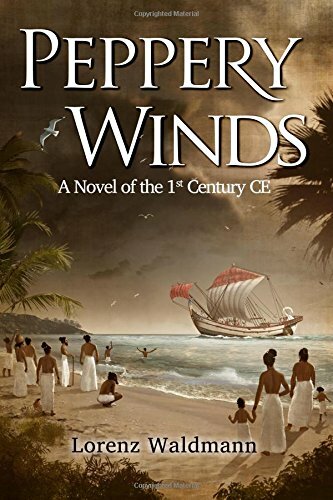 Peppery Winds: A Novel of the 1st Century C.E. Two young men of very different backgrounds, a spice merchant from Alexandria and a construction supervisor in the Temple in Jerusalem, set out on a newly-discovered open sea route to India, the home of black pepper. In Rome the demand for black pepper is insatiable and its price, sky-high. If the young men can successfully exploit this new route and thereby end the Arab monopoly on the pepper trade, glory and profits are theirs. But their assignment is fraught with danger: three murders have already been committed in order to preserve the secret of the open sea passage. Woven into this carefully researched 1st century CE tale of intrigue, love, adventure and revenge, is also a story of the first anti-Jewish pogrom, an encounter with the inscrutable Roman Emperor Caligula and a depiction of early Jewish and Greek settlements in India. Lorenz Waldmann holds advanced degrees in history and anthropology. His lasting interest in distant places and times, particularly India, is the happy consequence of travels beginning in early childhood. He now lives in Boca Raton, Florida.